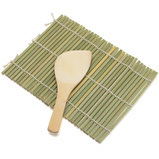 Everything Chopsticks offers Makisu bamboo mats for sushi making! 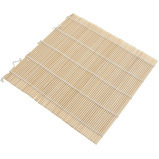 Browse our selection of sushi rolling mats made of either flat or rounded bamboo. 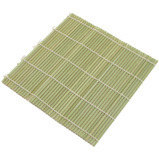 9.5 inch square flat bamboo sushi mat.The preferred style of bamboo sushi mat made of flat slats of bamboo with the green skin on one side. The skin helps keep food from sticking to the mat and the flat slats help make a consistent sushi roll shape. Indispensable for forming sushi rolls. Can also be useful for squeezing water out of cooked greens. Never put a bamboo sushi mat in the dishwasher. 9.5 inches square, woven with cotton cord. Made in China. Matchstick-style round bamboo sushi mat without the bamboo skin. Though not considered the preferred style of mat, some people still like using the round bamboo mat. Indispensable for forming sushi rolls. Can also be useful for squeezing water out of cooked greens. Never put a bamboo sushi mat in the dishwasher. 10.75 inches square, woven with cotton cord. Made in China.